Spector Pro is the best application of its kind, not bad at all! 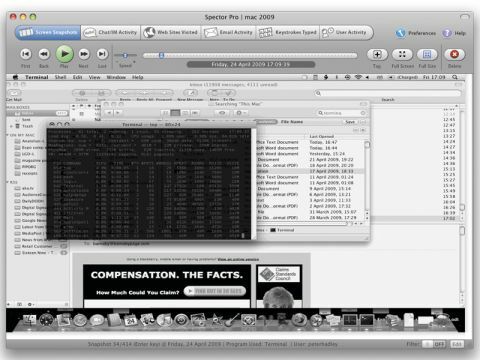 SpectorSoft's Spector Pro Mac 2009 records pretty much everything that a Mac user does, and hides this info in a secret place to be revealed only to you. It runs unobtrusively, with an icon in the menu bar reminding the user that it's watching, or in stealth mode. Among the data it records are snapshots of what's on-screen at designated intervals, the content of chat and IM sessions (though it can't see through SSL/TLS encryption), websites visited, email activity and all keystrokes. These give a detailed picture of what a user was doing, so anyone planning to use the app to monitor kids or employees, faces a choice of wading through immense quantities of data, or skimming through it at the risk of missing some undesirable activity. Spector Pro offers flexible configuration options, and we found its recording accurate. And while we managed to halt it through a little-known utility, it remained hidden from tools like Activity Monitor. Also, forum tips for evading Spector Pro are now ineffective. Unfortunately, you need to access the machine on which Spector Pro is installed in order to read its reports (or pay another $100 to have them emailed over using SpectorSoft's eBlaster). This makes surreptitious monitoring inconvenient, so it may be that its real value is as a deterrent rather than an informant.